This year the Brunswick County Chamber of Commerce is proud to announce the brand new event Christmas on the River Featuring the Brunswick Stew Cook-Off! The event will be held December 1, 2012 at Shallotte Riverside Park in Shallotte from 11:00 a.m. until 3:00 p.m. Whether you live nearby or are staying in a Sunset Beach NC vacation home, come participate in the day’s events. It will be a fun day filled with entertainment, kid’s activities, local arts and crafts vendors, barbeque and of course, delicious Brunswick Stew! Area restaurants, media members, businesses, individuals and nonprofits are invited to participate in our event by cooking their best Brunswick stew! If you’ve never had Brunswick stew then definitely come and treat yourself to the experience! If you’re staying in a Sunset Beach NC vacation home over the holiday season you should feel free to decorate for the holidays. 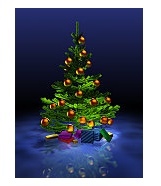 Christmas tree’s – both live and artificial – are available in the surrounding areas as are decorations. The following events are taking place in nearby communities over the next few weeks. The Christmas by the Sea Parade will be held on Oak Island beginning at 2 p.m. on December 1. Don’t miss the Christmas by the Sea House Tour also on Oak Island from 1-5 p.m., December 2. Southport Christmas Tour of Homes takes place from 2-7 p.m. on December 8 followed by the Southport Christmas Flotilla from 7-9 p.m. Also in Southport will be the Southport Waterfront Movie Series featuring “Arthur’s Christmas” playing on December 12 beginning at dusk.